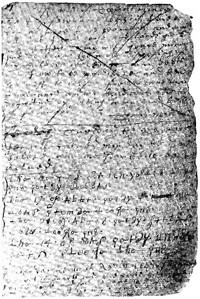 The diary of Thomas Miner is a unique memorial of daily life in 17th Century New England. Almost all other writing from the period concerns religious and legal matters. Although the entries are terse and never give details, they do give us a glimpse into his daily events and community activities. He records many births, marriages, and deaths among his neighbors. He meticulously records the day of the week, the number of days in the month and the year, for no doubt this served as his only calendar. He entered the date when a field was planted and its yield, for this would guide him in his planting the following year; unusual weather conditions such as “a great snow” or “bitter cold” made his diary truly his farmer’s almanac. The death of his 21-year-old son is reported in simple and unemotional language, though it must have caused him considerable pain. He makes brief notes of some of his financial transactions. It is quite probable that after the death of Thomas Miner, his son Manasseh Miner may have considered it his duty to continue a diary as long as possible. Manasseh’s diary covers 1696 – 1720 and is available on Ancestry.com. The above entry represents one month. It is somewhat difficult to track in detail what is happening in the diary – places aren’t identified in a recoverable way, and it is in many ways a listing of agricultural highlights, with occasional visitors or other events mentioned. Sabiantwosucke promised the .30. of desember befor mr stanton and tomus shaw to make Watch a canoow for that which I had and to bring me six pecks of nunup (Indian word for beans). By 1668, when this selection from his journal was written, Miner, his wife Grace, and their children were living in what is now Stonington, a town on the Connecticut coast. Indians lived nearby, and the journal shows Miner and his family interacting with them. Miner was a farmer, and he also had a number of public responsibilities including town treasurer, leader of the militia, selectman, and brander of horses. He also participated in church and in town meetings. This selection records one year in Miner’s life. He began the year in March, as people in England and New England did until the mid-eighteenth century. While his spelling is idiosyncratic and therefore difficult to read, the journal is a valuable record of how written English looked at that time—and probably also of how Miner pronounced his words. The ffirst month is march & hath .31. d: sabath day the first and in the first after the leap yeare and from the Creation .5617. and the yeare .1668. and the 20th yeare of the reinge of our lord King Charels the second the .6. day Thomas Tracie and leaffingwell was heare the .7. dai I branded .2. Coults [colts] I sowed hemp & pease in the orchard sabath day the .8. day: sabath day the 15. The 13. I was at mr palmes I had A barell of mallases [molasses] wensday the 18. we made an End between Jossepth & Marie Averie monday the 30 day I ffecthed [fetched] my wifes mare and 26. day Thursday we trained fryday .31. The second moneth is Aprile and hath 30 days wensday the ffirst we sowed pease in the plaine & wheate: the 7. day we had a towne meeting wensday the .8 I gardned the .9 day I mended the Brige & was at Tagwoncke The 14. day it snowed and the 15 day being wensday ye 16 day we plowed ffor segamoot in the plaine The 20 day mr Brewster and mr star was heare I marked the red mares Coult wensday the .22. I sowed fflax the 23 I was with mr noyce to pay him it was wet. The fouerth moneth is June and hath .30. days monday the ffirst: The .4. I came from new london the same day I received .3 letters ffrom bristoll & monday the 8 I was caring wood the tenth I was lookeing horses Monday the .15 hanah [his daughter] went to Tagwonck The same day was a towne meeting to Chuse a Constable Thomas wheeler was Chosen my lot drawne and the 18 day we ended all about our ffarmes agedowset his five ackers [acres] laid out and he and I exchanged monday 22. the 23 day I was branding horses 24 day my wife came whome sicke ffrom Tagwouncke monday 29 I had mowed most of my orchard Tusday the 30 I was to go to New london we Killed the catle. The sixt moneth is Agust and hath .31. days saterday the ffirst we tooke all our fflag out of the water the ffifte day wensday I was at Crandals mill saterday the .8. Crandall and his wife was heare we had Ten load of hay whome monday 10 I went to bostowne with the oxen saterday the 15 monday the 17 I came whom from bostowne and saterday 22 I ffecthed the litel Reeck with the .2. steer: and The .27. we had ale our hay whome. 28. we gathered aples saterday .29. I writ letters to Bristoll monday 31. The leventh month is Januarie and hath .31. days ffriday the ffirst and ffriday the eight I tooke up my bay horse The 13 day mr noyce Captaine and his wife was heare the 14 day Ephraim and marie was heare and ffecthed wood the ffifteen ffriday The 20 day wensday The meeting was at our house ffriday 22 The snow melted all away the 23 day we ffecthed wood ffriday the 29 and sabath the .31. The 25 day of ffebruarie .1668. there was due to me Thirteen shillings from Thomas bell. There is an interesting analysis of his diary in “By Nature and by Custom Cursed: Transatlantic Civil Discourse and New England Cultural Production, 1620-1660, by Phillip H. Round, Tufts University, starting on page 99. If this link is still valid, you may find this here. One thing I found a little surprising in the diary was the prickly nature of the relationships between the settlers; at some points they were suing each other over matters, at others supporting each other in various ways, or cooperating in politics. Called to view the dead body of William Bostuck being by the jury conceived to be poysoned. Cheesbrough and Miner were not friends, nor were Mr. Richardson and the constable, but neither did these townsmen play the roles of insider and outsider, elect and reprobate. Both Cheesbrough and Miner garnered enough of the assembled town’s approval to be elected to serve together as deputies of the court. 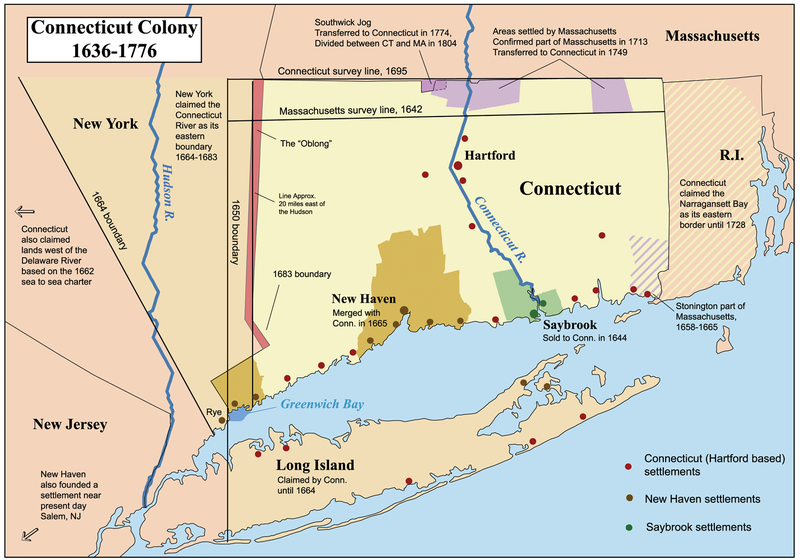 1649 – The first settler of Stonington, Connecticut, William Cheesebrough , a gunsmith, came in the spring of 1649, overland from Rehoboth in Plymouth where he had been accused (falsely, he always maintained) of selling firearms to the Indians. He came with his wife, Anna Stevenson, and their sons. He picked a site on a knoll on the west bank at the head of Wequetequock Cove where there was a well sheltered landing place and open meadows for grazing and cultivation. But the authorities suspected he planned illicit trade in rum and firearms with the Indians, so on 7 Nov 1649, the constable at Pequot (New London) informed him that ‘the Goverm’t of Connecticutt doth disslike and distastes the way hee is in and trade he doth among the Indians; and they doe require him to desiste therefrom,’ ordering him to report to [our ancestor] Major John MASON at Saybrook, or some other magistrate, and give an account of himself and his lonely settlement. East of Chesebrough, on the Pawcatuck (just across the river from present Rhode Island), Thomas Stanton built his Indian trading post. A monopoly of trade in furs with the Indians was sort of bonus to the salary of $25 a year paid by the Connecticut colony for his services as official interpreter. Walter Palmer, a six-foot-four giant, 68 years old, settled close beside his friend Chesebrough, and Palmer son-in-law, Thomas MINER, took up land four miles westward at Quiambaug Cove. George Denison came in 1654 with his family and located a little north of MINER on a rocky knoll overlooking a great meadow with a glimpse of the ocean beyond. He erected a little lean-to and surrounded it with a stout stockade. and so I say amen. This entry was posted in Fun Stuff, Line - Miner, Storied and tagged Thomas Miner. Bookmark the permalink. I just built up my first blog and i need someone’s suggestion for templates and good plugins. Thanks in advance. Thank you. As a Thomas Minor descendant, I find this very interesting. I am also finding all of this very interesting. You have gone to a tremendous amount of work here. I’ve spend the last couple of hours on your site, transfixed. Thank you for bringing these people to life for me. If any Canadian relations (or other) would like the documents and archives we have (obits, land deeds, etc) they can contact me on ancestry at chipgasser or chip@chipgasser.net. Absolutely amazing and so meticulous and well done! While I do not carry the (Miner/or ) surname, I am a descendant- a missing link for years until I found the marriage certificate of my 4th Great Grandfather. Gives me chills of excitement to read the history of our ancestors! Now I know why my Dad loved reading history so much and building model ships – stringing and tending the sails of each one of them ever so delicately, meticulous as well. At home, he was a master craftsman! By the Grace of God-We travel forward in time. With Blessings -YOU, You, have Given All of Us — Many Blessings!! We are able to see back in time what our ancestors endured, sacrificed, and provided for their families, for Our families, they helped to settled a very young underpopulated land, and tamed a very wild and unknown territory and fought for the soil before we were a country. Simply amazed and excited to know that this ancestral line can be traced back so far with history to support it. I am glad you enjoyed it. I agree, Thomas Miner left a tiny window into his life.